Two more Ohio prospects came off the board in the past week, headlined by an unexpected verbal to an in-state powerhouse from one of the most promising players in the Buckeye State’s class of 2014. Mark Alstork – ’13 Dayton Thurgood Marshall SG/SF: Alstork committed to Drake University, a mid-major school from the prestigious Missouri Valley Conference, on his official visit to the campus, in Iowa, over the weekend. The visit was the first official visit taken by the Dayton wing, who’s numbers this year earned him several Division I offers including Bethune-Cookman, Illinois State and Fairleigh Dickinson. Alstork credited the family like atmosphere, an opportunity to play right away and a good educational opportunity as his primary reasons for selecting Drake, who he will sign with in the spring. The 6’4 wing guard is a high volume scorer that can get to the basket and shoot it out to deep, but his best attribute is his ability to create shots for himself off of the dribble in mid-range areas. Alstork also has good strength for his size, which should help with the transition to college basketball. 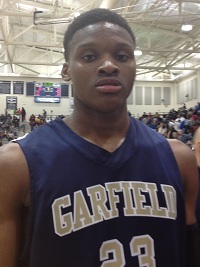 David Bell – ’14 Cleveland Garfield Heights C: The 6’9 interior prospect shocked the college basketball recruiting world last Monday when he verbally committed to Ohio State. An athletic post player who is coming off a missed season due to injury, Bell has blown up this season; particularly at Flyin’ to the Hoop in January in Dayton. Bell can block shots and use his size to rebound and score, although he is still working on his all-around game. The junior from Cleveland chose Ohio State early because he’s always been a Buckeyes fan, and jumped on the offer when it came. This season, Bell had been attracting interest from other high majors, most notably West Virginia and Michigan, but in the end his love of Ohio State was too much to pass up. The verbal by Bell gives Ohio State a nice headstart to their 2014 recruiting class, as Bell is joined by fellow in-state prospect Jae’sean Tate and Illinois superstar Keita Bates-Diop as pledges for the Bucks.